The Purple Scarf: Happening Weekend: Salsa, Food & Fringe! Happy Belated Canada Day! It may not feel like it (at least for me), but it's another weekend in Toronto. For those who had a day or two or more off this week, the weekend came quick and it's full of great events to keep the Canada Day celebration spirit going. And for those that didn't get a chance to enjoy Canada Day, it's the perfect time to celebrate our Nation's birthday (belatedly) and of course summer! Here are my top picks for fun and fabulous things to do in Toronto! Salsa on St. Clair happens on Saturday and Sunday. A friend was telling me about this event a few days ago and it sounded like so much fun! Dancing in the street, with hundreds of other people, street vendors, and food! I definitely want to check this one out! Another street fest happening on St. Clair, just several blocks away, is Corso Italia Mercato. Celebrating all things Italian - there will be street performers, art, shopping, and food. Like movies? The Toronto Beaches Film Festival kicks off this Saturday at the Fox. Really like movies? The Christie Pits Film Festival begins this Sunday and will runs every Sunday until August 23rd. A great way to Celebrate Canada Day is to visit two great Canadian artists. The Emily Carr and Stephen Andrews exhibits are still running at the AGO. Make sure to check them out before they are gone! Afrofest - Canada's largest annual African music fest takes over Woodbine Park this weekend. Drumming performances and dance, as well as theatre, workshops, and of course food vendors will be taking place this year. Admission is free! Taste of Lawrence starts on Friday and runs until Sunday on the east side. A variety of vendors, entertainment, midway rides, and fun things for the kids makes up this three day celebration. DJ Deep Fried Fridays begins this Friday and happens every Friday night until September, down at The Harbourfront. Enjoy food, dancing, and DJ's spinning some fun music. 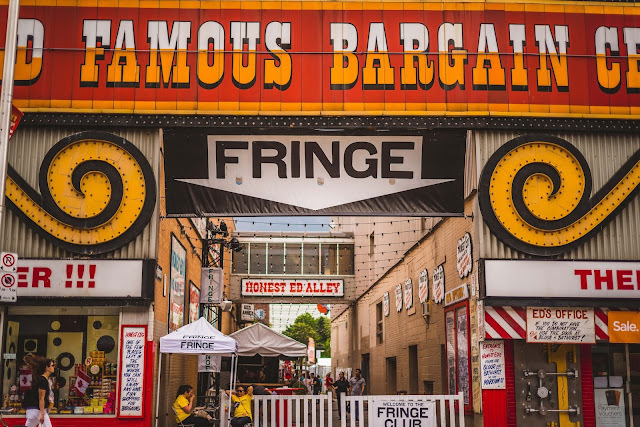 The Toronto Fringe Festival started this past Wednesday and will continue until July 12. Amazing theatre, dance, and other shows are on the schedule, including the fabulous Me With You by Loose Leaf Theatre. Want to find out more? Check out my Fringe post on City By Heart. Taste of Toronto started on Thursday and runs until Sunday at Fort York. Over 30 chefs will be serving up some tasty fare, as well as master classes and a marketplace are apart of the event. The Really Really Free Market happens on Friday at Campbell Park. Do some summer cleaning and drop off stuff that you don't want. See something you like - take it! It's free. Seriously. P.s! : The Pan Am games start soon and there are plenty of Torch Relay Celebrations happening across the city!